Join us for a seminar based on How Can We Make More Money? 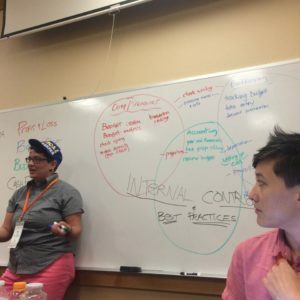 A Values-Based Finance Education Kit, a collaborative project of Open Bookkeeping, A Bookkeeping Cooperative, Toolbox for Education & Social Action, Fortify Community Health, and the Anti-Oppression Resource Training Alliance. Build skills to strengthen your organization’s approach to finances and budgeting for social change. This seminar is designed for people at all levels. If you are a worker-owner, an educator, a cooperative developer, a community leader, or a board member of a group-oriented organization, this seminar is for you! Alex Fischer brings a strong commitment to racial, economic and gender justice to their finance work. With over a decade of financial consulting and bookkeeping experience, Alex founded Open Bookkeeping, based in Brattleboro, VT, to bring a justice perspective to bookkeeping & organizational finance management. 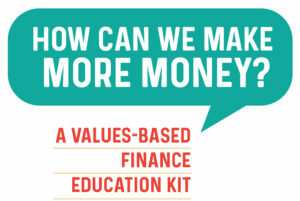 They believe that financial literacy is critical to empowering leadership and creating truly democratic organizations that can harness the genius of all its members, especially those from frontline communities. With a passion for engaging and interactive facilitation, they are known for creating fun financial workshops. Alex is a self-taught bookkeeper and holds an MBA in Managing for Sustainability from Marlboro Graduate School. The seminar begins with dinner and opening at 6pm on Friday March 29th and runs until 6pm on Sunday March 31st. There will be breaks scheduled throughout and participants are encouraged to do what they need in order to participate fully. Because this seminar is cumulative, there is no partial attendance. The registration fee includes over 17 hours of training and meals during workshop hours. To support scholarships for the seminar, we invite applicants able to do so to pledge a higher registration fee. Application Deadline: Sunday March 3rd. Past this date, we are accepting applications for the wait list. Registration does not include travel or lodging. After applications are received, we will let applicants know if they are confirmed and will send payment details and address. We’re committed to accepting a diverse group and to supporting people with less access to resources to attend. If you don´t plan to attend, but still wish to make a donation to support the Kit and scholarships for this seminar, please donate here. Thank you for supporting financial literacy and movement capacity building! We are currently scheduling seminars for 2019. If you are interested in hosting or attending in a different location, please reach out! ← Happy New Year from ABC!